The romantic Latin ballad style known as Bolero arrived in Mexico from Cuba in the 1920s and took off during the Golden Age of Mexican cinema in the '40s. American singers such as Nat King Cole and Eydie Gormé helped to popularize it in the U.S., in the late 1950s and '60s. In Los Angeles, a guitarist and his trio are bringing it back. Thirty-year-old guitarist Roberto Carlos is the force behind the revival of Boleros in L.A. with his band, Tres Souls. His father introduced him to the romantic ballads when he was a teenager and encouraged him to learn the guitar. "Our teacher, our music instructor, he taught us Bolero music," Carlos said. "My dad was pushing us to learn Bolero music. At the age of 15 we started playing at small restaurants with my brother Pepe." A few years ago, Carlos started getting serious about Bolero - gathering with friends, listening to Boleros on vinyl records, and talking about the music and its composers. "And then from there we moved to, 'hey, how about if we take it from a small gathering dining room to an art gallery?'" he said. "From an art gallery we came to La Plaza de Cultura y Artes." 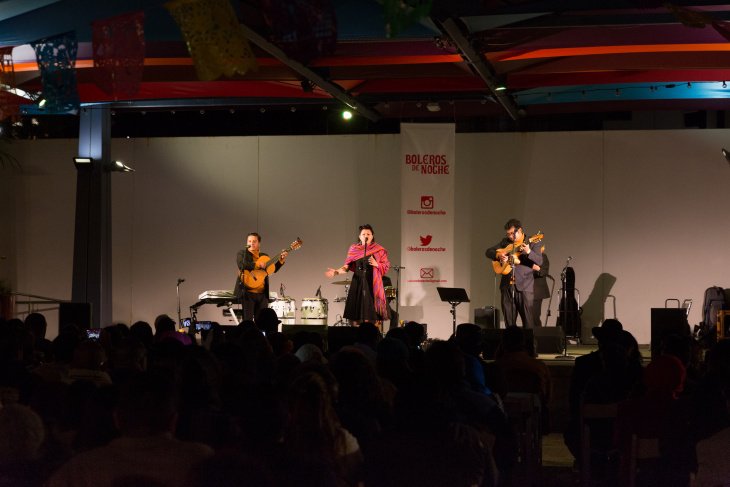 Since 2016, Carlos has been organizing "Boleros de Noche" concerts at multiple venues around L.A. At a recent concert at La Plaza de Cultura y Artes, more than five hundred people were in attendance, which speaks to the popularity of this music style among Latinos in Southern California. Martha Gonzalez, lead singer of the Grammy-Award winning band Quetzal, also performs Boleros. 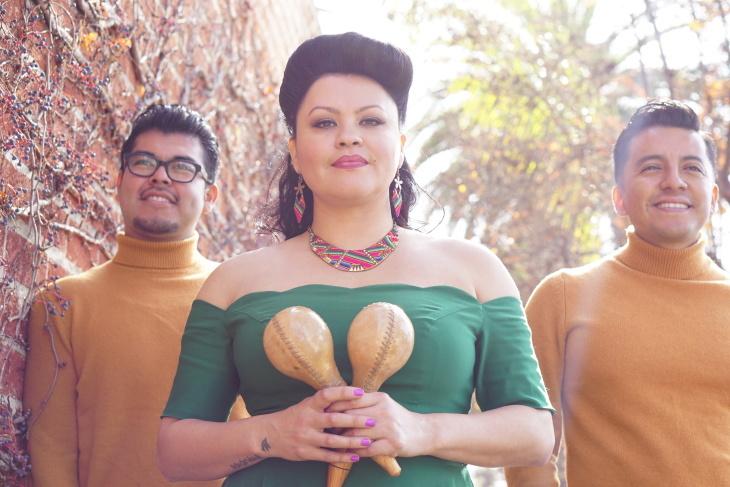 Gonzalez grew up listening and singing Boleros and said this music is part of the soundtrack of every other Latino home in L.A.
"Bolero is yet another incredible music genre that we as Mexicanos have innovated on and made it our own," Gonzalez said. "It's not exactly dance music, there are some that you can probably sway to but mostly you listen; it's sit-down-and-listen culture that gets you to reflect on life, on love, lost love, new love, even hate and the capacity to go from love and hate. "It's just an exploration of the human emotion and I think it's just a beautiful art form." American audiences first heard Boleros sung in Spanish in the late '50s when Nat King Cole released the album titled Cole Español. The album's orchestra was recorded in Cuba, though Cole recorded his vocals at Capitol Studios in Hollywood. One of the big hits from that album is the classic "Quizás, Quizás, Quizás." In the mid-1960s, Boleros were introduced to a new audience by singer Eydie Gormé, who recorded a couple albums in Spanish with the Mexican trio that popularized the style around the world: Los Panchos. In their own way, the group Tres Souls are following in the footsteps of Los Panchos and other trios. All three members sing, and the fourth voice is the lead guitar, played by Jesús Martínez. He says the requinto guitar plays in between the lead singer, and its role is to embellish the song. "It's those little licks that you hear in between the vocal breaks", said Martínez. "It's very much another voice and I think that's definitely what I try to get to — a singing voice with the requinto. And depending on the singer, depending on the song, how much you want to put in, how little you want to put in, how loud, how soft, all of that." Tres Souls just released their first album, Boleros Made in L.A. Lead guitarist Martínez explained that their Bolero style follows the classic sound of the trio, but they added the electric guitar to give the songs a richer quality. The album also includes samples of movies from the Golden Age of Mexican cinema, which Martínez said was inspired by hip-hop. "Wu-Tang Clan was probably the first or one of the first, they sampled movies from Japan, these Kung Fu movies and then that's their whole style, he said. "And so I was like, 'hey we should just do Cinema de Oro, put it into our music, have it be a way to tell the story.'" Roberto Carlos said he wants people to enjoy timeless music that helps to bring families together. "I want people to appreciate what came before us — the trio románticos, the composers...and share it now and celebrate it, something that's really iconic to our culture," he said. The next "Boleros de Noche" concert is at the Downey Theatre in June, then a big show at the Ford Theatre in September — featuring the heirs of the legendary Trio Los Panchos.